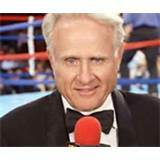 Dec. 14, 2012 - Larry Merchant, longtime boxing Analyst for HBO Sports, stated that he is retiring from ringside as of Saturday December 15th, when he will work his last fight. A 2009 International Boxing Hall of Fame inductee, Merchant has been paired with Jim Lampley since 1988. Max Kellerman, who has alternated with Merchant the past few years, will now be the full-time HBO ringside boxing commentator and post-fight interviewer. Kellerman joined HBO Sports in 2005.